The Burracoppin North Project consists of two Exploration Licenses, E70/4992 and E77/2463, covering a combined area of approximately 422 km2, and located ~50km ENE of the regional Wheatbelt service town of Merredin. The key target at Burracoppin North is Anomaly 47 and vicinity, an area of ~100km2 prospective for metamorphosed polymetallic VMS deposits that has been poorly explored with only minimal drilling deeper despite large multi-element VMS pathfinder anomalism at surface, and wide, low-grade, shallow drill intercepts intersected by previous explorers including 96m @ 3.06g/t Ag + 0.05g/t Au + 0.05% Pb + 0.43% Zn from 7m to EOH and narrow, higher-grade intervals such as 10m @ 13.05g/t Ag + 0.14g/t Au + 0.14% Pb from 33m, 1m @ 22.30g/t Ag + 1.03g/t Au + 0.26% Pb + 0.08% Zn from 61m (all hole A47RC004)1. 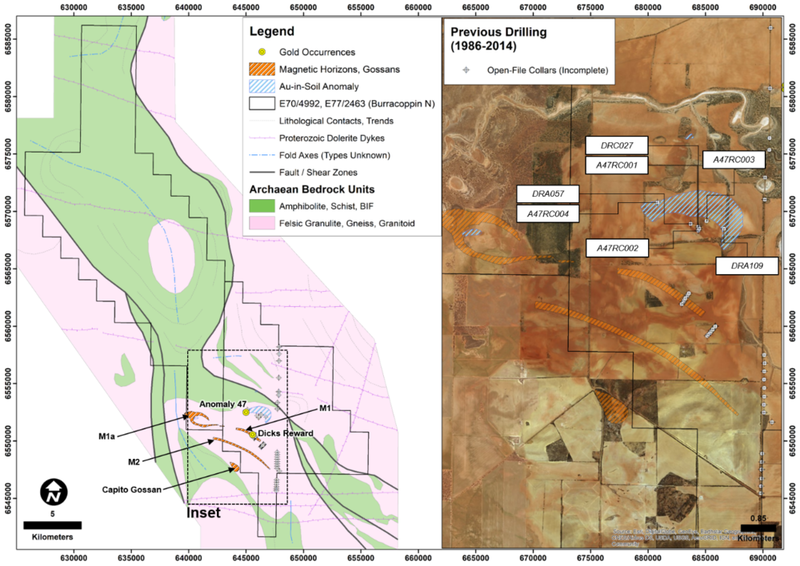 In addition, Burracoppin North presents a large land package covering gold-prospective felsic to mafic granulite successions along strike from the nearby Edna May gold mine located less than 15km to the SE of the project’s southern tenement boundary. Note 1: Information on historical results, including JORC Code Table 1 information, is contained in the Independent Technical Assessment Report within Cygnus’ Prospectus dated 22 November 2017. Cygnus is not aware of any new information or data that materially affects the information included in the Prospectus.